There may not be a Gothic villain ready to abduct her, but the journey, nevertheless, signifies an important change. The Allens are not Catherine’s parents, and Mrs Allen proves to be a careless chaperone. She sees nothing wrong with Catherine becoming best friends with the flighty Isabella Thorpe, daughter of her old friend Mrs Thorpe, nor of Catherine driving out alone with that boastful rattle, John Thorpe. To all intents and purposes, the good-hearted, transparently honest but naïve Catherine has to manage on her own. At first, she finds John Thorpe’s boastfulness difficult to cope with. When Thorpe takes her for a drive he tells her not to be frightened ‘if my horse should dance about a little at first setting off. 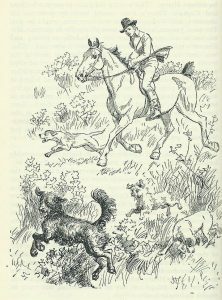 He will, most likely, give a plunge or two…’ Catherine takes what he says at face value and tries not to be frightened, but, when the horse sets off ‘in the quietest manner imaginable, without a plunge or a caper,’ she begins to re-evaluate him. There’s another problem; she is so unused to men that she doesn’t know how to say ‘No’ to Thorpe’s invitations without being impolite. And he is very importunate: he tells her that she’s reserved a dance for him, when she hasn’t – and she’s desperate to avoid him and dance with Henry Tilney. 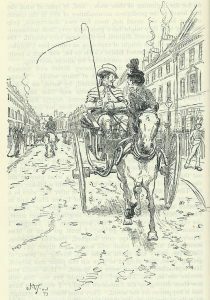 Then, when she arranges to go for a walk with Eleanor Tilney and Henry, Thorpe tells her that he saw them drive off in a smart phaeton. It’s a lie – which puts her in an awkward position when she learns the truth. None of this would have happened if Catherine’s mother had been there; she’d have seen through the Thorpes immediately. It’s a steep learning curve for Catherine who goes through agonies before she can apologize to the Tilneys. 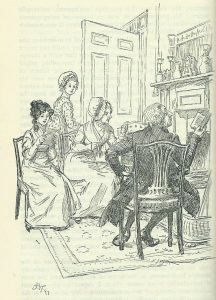 She can’t confide in Mrs Allen (who is Mrs Thorpe’s friend) so she has to work out for herself what is the right thing to do and then do it, even if it means braving the fearsome General Tilney in his own home. This, together with the overlong two hour ‘bait’ half way through the journey, conveys perfectly the General’s selfishness and bullying. 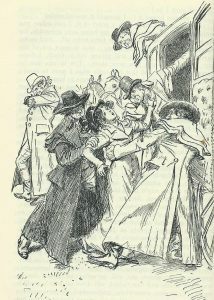 He and Henry are travelling in the curricle, with room to spread out; the three women are squashed into the carriage with far too much luggage packed around them. Fortunately, after lunch, the General suggests that Catherine ride with Henry in the curricle. She is thrilled to have the opportunity of being alone with him – even though she’s a bit worried about its propriety. During the drive, Henry teases her about the horrors in store for her at Northanger Abbey: her gloomy bedroom will lead to a subterranean passage with rusting instruments of torture, a bloody dagger and an old-fashioned cabinet…. This leg of the journey is important, plot-wise. It allows time for Catherine and Henry become more intimate; it’s the first time they have been alone together for any length of time. We can see how amused Henry is by the Gothic vision he has conjured up and by Catherine’s artless responses. Generally speaking, the trips, both long and short, have allowed Catherine the space, away from home, to become her own person, and to grow up. She has travelled with the Allens, John Thorpe, the General, and Henry, and has learnt from all of them. We can see the extent of her emotional maturation during the time she’s been away from home in the last journey. General Tilney, furious at discovering – so he thinks – that Catherine is from ‘a necessitous family …by no means respected in their neighbourhood…. A forward, bragging, scheming race’, orders a hack post chaise to collect her at 7 a.m. the following morning and more or less throws her out of the house. To see just how callous he is, we need to look at what the journey entails. Catherine must go from Northanger Abbey in Gloucestershire, to Fullerton, near Salisbury in Wiltshire, a sixty mile journey which will take eleven hours. It will cost Catherine £3 to £4 in total: roughly a shilling per mile plus any extras, such as refreshments. Her father gave her ten guineas (£10.10s.0d) when she left home eleven weeks before but we know that she bought herself a muslin dress in Bath and doubtless other things, too. Catherine realizes, with horror, that she may not even have enough money to get home. Eleanor lends her some. Catherine has a complicated journey ahead of her. 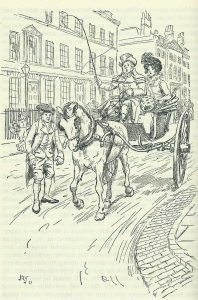 The hack (hired) post chaise was a four wheeled carriage for two people, pulled by two horses. The horses would have to be changed every ten miles or so at a posting inn. Posting inns also hired out the post chaises which operated locally. So she might also have to change to a different post chaise at various points along the journey. Fortunately, the hack post chaise system was well-organized and efficient and her route was straight-forward. Even so, Catherine might well have feared so long a journey and one where she was largely ignorant of the route, let alone how to manage all the changes. But everything went well: ‘She met with nothing, however, to distress or frighten her. 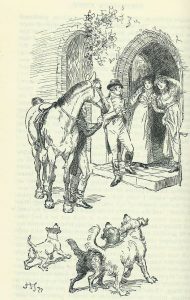 Her youth, civil manners, and liberal pay, procured her all the attention that a traveller like herself could require.’ Her manners, we note, are a lot better than the General’s ‘angry impatience’ in the inn on their way to Northanger Abbey. The Catherine who has returned home is a different creature from the girl who left Fullerton nearly three months before. Then, she lived mainly inside her head, absorbed in her internal world of Gothic fantasy. Now, she is wiser in the ways of the world; she can spot a bully and a braggart; she knows how to value an Eleanor above an Isabella; and she has become acquainted with her own heart and found a man worthy to be loved. Each of her journeys has had something to teach her. Travel has enabled her to grow up. I absolutely agree with you, Jan. I have to say that Henry’s invented spoof Gothic novel episode in Chapter 20 makes me laugh out loud. It’s one of the funniest first pages in Austen for me. But I love this analysis, Elizabeth. I hadn’t looked at it in quite that way and it’s a long time since I read it. I shall enjoy it all the better for your insights the next time I read it. Thank you so much, Elizabeth. What triggered this blog was reading Jane Austen’s letters. She and Cassandra always seemed to be waiting for one of their menfolk to take them to places. It then struck me that, in her novels, only rich widows, like Lady Russell and Lady Catherine de Bourgh travelled where they wanted when they wanted. Yet even a young midshipman, like William Price, could get himself from Portsmouth to Mansfield Park by himself, without fuss.